Okay, we've discussed lighting, now what about sound? The prepared and properly equipped bicyclist has both a polite bell and an obnoxiously loud horn. A bell is much nicer than yelling "on your left at pedestrians walking on multi-use paths. Yelling "on your left" often causes pedestrians to move to their left, directly into your path (which is actually more dangerous than just silently weaving around them before they have a chance to do anything stupid). I'm partial to the classic Chinese spinning bell. A loud horn can come in handy on a bicycle to wake up clueless motorists chatting on their mobile phones as they cruise through red lights, exit shopping centers without looking for bicycles, and back out of driveways into the bike lane without carefully looking for bicycles. Always be prepared to stop or take evasive action if the motorist doesn't respond to the horn, but I find a loud horn very effective. The Airzound II is designed for bicycles (be sure not to get the older Airzound model), and you refill the air bottle with a bicycle pump. 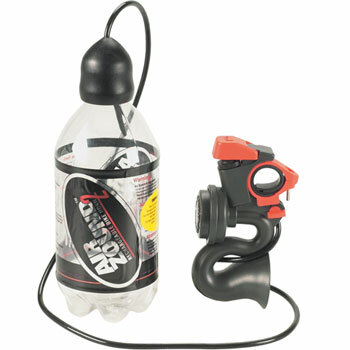 The downside of the Airzound II is that it is yet one more accessory that uses a water bottle cage, and you have to run the tubing from the air bottle to the handlebars. You might consider one of the Minoura handlebar water bottle cage mounts for the Airzound II (a bottle of air does not weigh much). 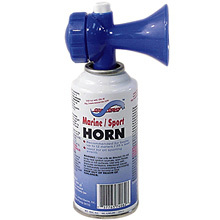 Boat supply stores will sell the small air-powered horns. You can fasten it to your handlebars with two hose clamps (one around the can, one around the handlebars. Refills are available, but they are not much less than a complete new horn. As a pedestrian these horns are useful as well, especially in areas where red light and stop sign running is rampant. These horns are not very rugged and the plastic horn often snaps of the air nozzle of the can. 12 volt electric horns are available for about $11, and if you already have a 12 volt lighting system then they are a viable option (but you'll have to carry your battery around even in the daytime so consider a second, smaller battery for daytime rides). You will also need a horn button that can be mounted to the handlebars (can be purchased at an auto parts store, Walmart, or on-line). You could also add another switch to your lighting switch box for the horn (momentary action, normally open, sufficient amperage rating), but the switch box needs to be mounted on the handlebars. 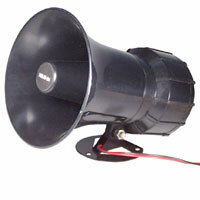 Small 12 volt sirens also can function as a horn. Does anyone remember those mechanical tire-driven sirens for bicycles where you pulled on a chain to engage the siren? How about Vroom motors? dB not specified, but newer model is 125dB. Extremely loud, and a short blast sounds like a high tone horn. I installed one of these on my commute bicycle and I have to disconnect the battery at work for fear of people coming into my office and pushing the horn button.